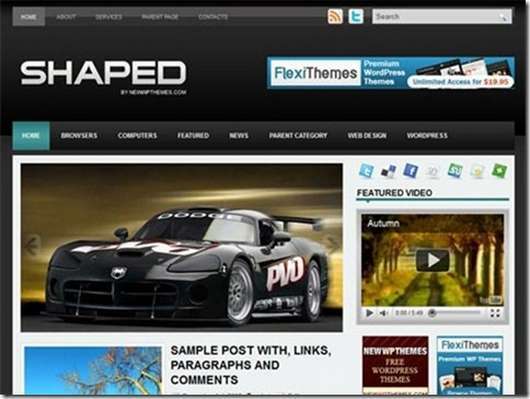 Shaped is a free WordPress theme. This theme features content option and supports the post thumbnails. This theme is suitable for any theme, especially on entertainment. The theme options are found at the admin panel. This feature is also the best for web designers and anyone willing to use it. The best way to create a website is by trying out new things. Therefore, when you are trying out new things, let themes be one of them. This means that you should try out this theme also. This theme has a lot to offer to all its subscribers. Since this theme is free, you can use it on as many websites as you want. However, to many, this websiteis found on three versions. The first version is the free version. Most people opt to use this version in their blogs and other websites. The second version is the standard version. This version is the best for personal projects like websites and others. This version has some advantages over the free version. The version is bought at a one-time fee. The fee is $29.95. Some of the advantages that this version are, it has access to support forum, fully customize your footer and others. The third version is the developer version. The version has everything that a website needs. This theme is the best for client’s projectsand personal projects.You will get items like use in unlimited domain, access to support forums, fully customize your footer and others.